Trauma tremors are compulsive or involuntary trembling that occurs after a shock or scare. Also known as the jitters, knocking knees and shaking like a leaf, such tremors are the body's way of releasing excess energy and stress. These neurogenic tremors may also occur following an intense exercise workout or burst of activity. Stretching exercises may help release built-up tension for neuromuscular relief. Following an emotionally traumatic or intense incident, a yoga stretch such as the chest opener may help calm your mind and body. Place a rolled towel on the floor and lie down so that the towel is directly beneath your chest. Your head, shoulders and buttocks are on the floor, and your arms are relaxed and extended from your shoulders. Breathe deeply and slowly, inhaling and exhaling to the count of five for each, focusing on relaxing every muscle in your body. Breathe deeply for three to five minutes. Relieve leg tremors after an intense workout or activity with a wide-angled leg stretch. Lie on the floor on your back, and lift your legs up over your hips. Place your hands on the inside of each thigh, and press your legs gently toward the floor at your sides to give you a wider stretch. Point your toes toward your head so that your heels face the ceiling. Focus on relaxing your upper body, with your eyes closed. Hold for a minute or two. 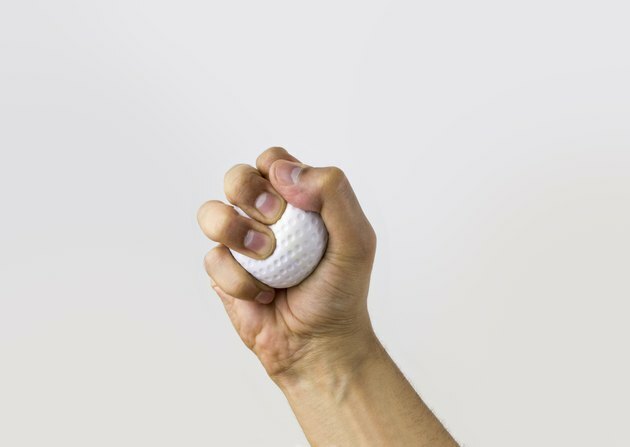 Reduce trauma tremors in your hands by squeezing hard on a soft object such as a tennis or handball. Grip the ball with your thumb on top of the ball and hold a squeeze for five seconds at a time. Release the ball and spread your fingers wide, holding the stretch for another five seconds. Repeat this alternating squeezing and opening move until the tremors lessen or stop. Repeat with the other hand. Do this exercise with both hands at the same time by making a fist. Contract, release and stretch your fingers in a pulsing sequence five to 10 times. Stretch many muscles in your body at the same time with a full-body stretch. Do this standing or lying down. Lying down on the floor, lift your arms above your head and extend your feet and legs downward, reaching for opposite sides of the room. Consciously contract all the muscles in your body, and then release. Repeat this several times for benefits of muscular tremor relief. Relieve tremors in your quadriceps and hamstrings by doing a standing hamstring stretch. Start with your right foot extended in front of the other, your toes pointing upward and your heel pressed firmly into the floor. Bend slightly forward with your hands braced against the upper thigh of the extended leg. Press your body weight onto the heel of your right foot, and lean forward until you feel a good stretch in the back of the extended thigh. Hold for several seconds, and then release. Repeat with your left leg. Relieve your sense of stress and relax the muscles in your torso with a gentle back arch or cat pose stretch. Get down on your hands and knees on the floor, then exhale and arch your back toward the ceiling. Tuck your pelvis under your hips, focusing on releasing tension in your shoulders, back, hips and legs. Hold this upward stretch and contraction for up to 30 seconds. Clear your mind of everything except the feel of your back and shoulder muscles opening, elongating and pulling upward. Inhale and allow your back to return to your starting position.